Track racing was not a big feature of growing up in Wiltshire. We were pretty well served by outdoor concrete bowls within an hour’s drive – Cardiff in one direction, Reading in the other – but rarely made the trip, preferring riding our bikes to travelling in cars. I maintain that stance still, opting for the nearby race whenever possible. Spending hours cooped up in a car seems to defeat the object. The other track within an hour or so’s drive was Calshot, the 160-metre wooden oval with dramatically steep banking initially built for the annual Skol 6 events, then retired to it’s permanent base in a vast former aircraft hanger on a spit of land jutting into the mouth of the Solent. The pine planks had, over the years, sunk between the uprights to an alarming degree, so that each lap became ‘bu-dum-bu-dum-bu-dum’, followed by smooth, ‘bu-dum-bu-dum-bu-dum’, smooth, ad infinitum. It was exhilarating and jarring in equal measure. Something had happened in the three intervening decades since my previous Calshot excursion. It was still thrilling, but also nausea-inducing. I fought to hold my line at the bottom of the banking, making the beginner’s error of backing off the power, sending the bike careering up the track. Even with one-to-one tuition, I couldn’t get my head round it. The carefree 14-year-old had turned into a lily-livered old git, green around the gills and trembling. I made my excuses and left. There’s no going back. The shallow concrete of Herne Hill is more suited to a man of my delicate disposition. Thankfully, I still get the same buzz out of watching track racing as the first Skol 6 I saw at the Empire Pool, Wembley, in ’77. The domestic professionals were familiar enough – Mick Bennett, Steve Heffernan, Tony Gowland – but it was the great Patrick Sercu that I had come to see, and he duly delivered. Graeme Fife interviews Sercu in the next issue of Rouleur, by the way. The Empire Pool was a draughty old wreck of a building, on its last legs, and what passed for music in those days was one scratched and worn vinyl copy of Popcorn by Hot Butter, one of the most infuriating ditties ever composed. Every lull in the action was filled with the kind of synthesizer noises that made one wish Mr Moog had never been born. It was still a great night out, though, especially for a bumpkin up from the Wild West Country for the night. Now that I’m a sophisticated townie from the Big Smoke [Are you quite sure about this? Ed] a night at the track is still a hoot, especially when there is a Rouleur-sponsored team involved. So thrilled were we to be leading the pack after the opening round of the Revolution series in October that the Editor, photographer Taz Darling and myself made sure we were in Manchester for round two. This left Iljo Keisse, European Madison champion and Six-Day star, to fly the Rouleur flag in the final event of the evening. And what a great job he did of pulling back the break and setting Mark Cavendish up for a very popular win. Now, why would he do that? “Fix!” we hear you cry. Maybe. Who cares? These events are great shows – no more, no less. Seeing the finest of British track riders alongside a smattering of European talent in a great velodrome with a World Champion turning on the style in front of a full house… what’s not to like? Here’s a clip of our man Keisse in the Devil. The music has improved somewhat, too. Finally, 30 years of Popcorn nightmares have been laid to rest. Tickets for the next Revolution on January 7 are available here. It used to be the case that temperance, turbo training, skill and mechanical nouse were enough to ensure you were a contender in the underground brotherhood of domestic British cyclo-cross racing. If more than 50 riders turned up for the senior men’s race at a National Trophy, the UK’s six race series of UCI sanctioned events, you were unlucky. If more than 40 riders finished you were unlucky. If you got lapped, you were unlucky. If you didn’t finish in the top 30, you were unlucky. Things haven’t been going great for me this season. I could blame the half-dozen Belgian full-timers who religiously cross the channel once a fortnight to bag our UCI points; I could blame the Under 23’s, who remain too few to support a race of their own, but too numerous to allow much room for the talentless, hardworking privateer everyman; or I could blame the gridding system, which rewards the best riders while punishing the worst. I could blame any number of factors, but the real culprit is Talent, or a lack of. Cyclo-cross, for so long a true stalwart of glamour-free cyclesport alongside 24-hour time trials and audaxes, has become the belle du jour, enticing hugely talented riders from across the cycling spectrum. Mountain bikers: check; crit specialists: present; roadies: here sir! There’s still no money in it, in this country at least, but the competition has become fierce. To get a result nowadays you need to be an athlete, not just a grafter. I can’t be bitter. Talent was always going to usurp the virtues of temperance, turbo training, skill and mechanical knowhow eventually. And hey, I had a good few years – I mean at first I couldn’t believe my luck: there were only about three of us taking it seriously, and the results came thick and fast. And while I was getting those decent results I was having about as much fun as you could possibly hope to have with a heart rate of 180bpm on a cold, wet and muddy Sunday afternoon. 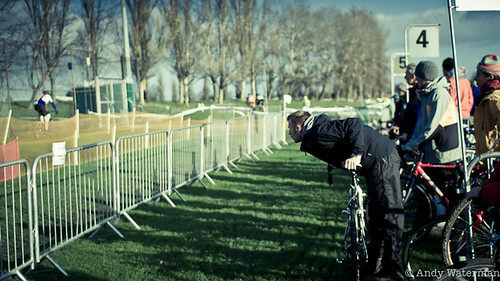 No, it’s nice to see some new blood discovering the joy of CX, and the string of bad results won’t put me off. 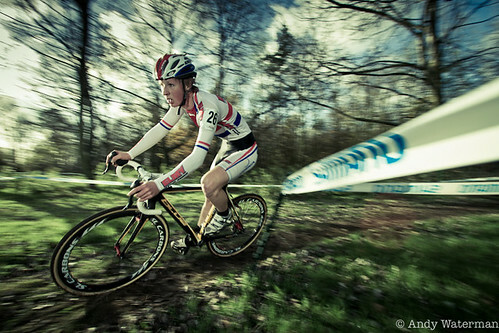 The cyclo-cross weekend has become part of my routine now. Travelling up on a Saturday; stretching the legs on the turbo in the hotel room on Saturday night; eating a fried breakfast on Sunday morning before getting to the course at 9.30am to assist the veterans and women on the team. That’s one of the nice things about cross: shorter races mean you can help each other out, working in the pits for your team-mates, them returning the favour later on. Then at midday it’s into race mode. Get dressed and onto the course; experiment with tyres and pressures; practice the technical sections to get them down pat; eat, drink, back on the turbo to warm up for the race. The racing itself invariably flies by, almost unnoticed: getting it over and done with is as much a relief as a pleasure. Instead it’s the banter and the processes around the racing that become the story. 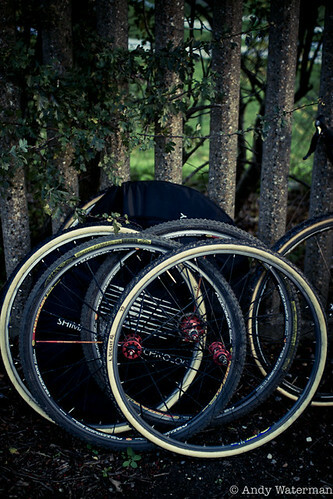 The van loads of wheels, the container loads of kit, the piss-taking and the practicing – cross quickly becomes a lifestyle. This weekend we’re going to Bradford to race at the fearful Peel Park – a natural bowl with a steep, slick and slippery off-camber descent that has proved to be a crowd favourite every year I’ve been racing. With the weather finally turning wintery, it’s likely to be complete hell. 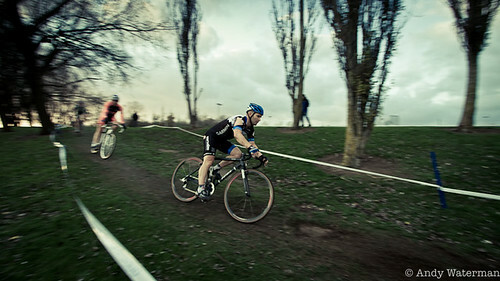 The photos here were taken a fortnight ago at the National Trophy race in Derby. I finished 41st, six and a half minutes behind the winner, Floris de Tier of Belgium. If I can avoid getting lapped in Bradford, I’ll be a happy man. Andy is Deputy Editor of Privateer magazine and a member of the ViCiOUS VELO team of wastrels and ne’er-do-wells. The bodies are laid out on verges and pavements, in front gardens and parking lots, utterly exhausted cyclists who have finally given in to the overpowering urge to rest, to close their eyes and slip into unconsciousness. Yates, himself wired and fatigued, has drawn the obvious parallel: sleep and death are brothers, two takes on oblivion, each a simulacrum of the other. Sleep, the essential, quotidian negation of consciousness. Death, the final, inescapable and infinite sleep, the negation of life. It is very far from normal. Wig Worland’s photographic account lays bare the nihilistic qualities of PBP, an almost unimaginably arduous journey through a featureless landscape of dull, rolling farmland (with over 9,000 metres of climbing, it is by no means flat) that ends where it begins. You have to ask the question: what kind of person subjects themselves to a race like this? What is going on in their exhausted, sleep-deprived minds? Motivations are hard to fathom and every rider is different, but there is something that unites them all: it is about going to the limit, and then some, but coming out alive. Which is greater, the mental challenge or the physical? After all the body can be trained to perform, but can the mind be trained to suffer? On December 28, 1963, a 17-year-old Californian high school student by the name of Randy Gardner was the subject of a sleep deprivation experiment. He was also going for a new World Record for staying awake, setting a target of 264 hours, or eleven days. It remains unbroken as the longest documented case of staying awake. By the second day Randy was experiencing difficulty focusing his eyes. By the fourth, he had become irritable, suffered memory lapses, slurred speech and found it impossible to concentrate. He began to see things that weren’t there. Five days into his marathon of sleeplessness, he became convinced he was an NFL player and would get agitated with anyone who disputed this. By the ninth day Gardner was unable to finish his sentences, lost all facial expression and developed hand tremors and involuntary jerks in his upper arms. Keep laboratory rats awake for a fortnight and they will die. That could be why the Guinness World Records no longer accepts sleep deprivation attempts due to the health risks involved. Sleep deprivation impairs the functioning of the frontal lobe, the part of the brain where much of our humanity resides. The frontal lobe gives us our powers of reason, memory, self-awareness, empathy, language, innovation, and critically when riding a bicycle at speed, the ability to do multiple things at the same time and to assess risks and react appropriately.